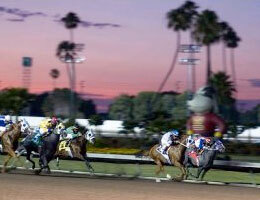 Two-year-olds will be back in action beginning Friday at Los Alamitos Race Course. LOS ALAMITOS, CA—APRIL 11, 2019—Los Alamitos Race Course will host its first two races of the meet for 2-year-old Quarter Horses when 15 juveniles debut on Friday night. The eight-race program starts at 6 p.m. Seven 2-year-old fillies will be in action in the fifth race, while eight 2-year-olds will race in the seventh. Oklahoma-based Reliance Ranches LLC began its local 2018 campaign in great form thanks to terrific early victories from juveniles SC Coronada and SC Money Maker. Both runners won their first Los Alamitos starts before qualifying to the Grade 2 Robert Adair Kindergarten Futurity in early May. Reliance Ranches would love to have a similar start to its 2019 season at Los Alamitos when they are represented by the filly Dreams Divine in the fifth race and by the gelding Invader in the seventh. Dreams Divine and Invader have twice worked together in preparation for their races with the filly looking the more impressive of the two. Bradbury Racing's O Yes I Can, who had the fastest of 26 works on March 16, is among the top contenders in the fifth. In the seventh, EG High Desert Farms' Hawks Valentine figures to challenge in the seventh. After giving longtime trainer Robert Bean his first ever stakes victory at Los Alamitos Race Course, the 4-year-old Thoroughbred colt Candy Zip returns to action to headline a solid field of eight in the $20,000 Wheatland Handicap at 870 yards on Saturday night. First post is also 6 p.m. Owned by the trainer, Candy Zip pulled away from talented Quarter Horses Run Raging Rhino Run and Bound To Bet to score an impressive four-length victory in the Rossmoor on March 6. His winning time of :44.453 is the meet's fastest at 870 yards. Candy Zip had previously run second to multiple local winner Oil at this distance. For Bean, scoring his first Los Alamitos stakes win was special, but the longtime horseman has enjoyed other memorable moments in racing. For actor Jack Klugman, Bean hot walked multiple stakes winner Jaklin Klugman, who ran third to the filly Genuine Risk in the 1980 Kentucky Derby. Bean and Klugman were the co-breeder of the stakes winner Barbie Karen, who won the Lady Morvich Handicap at Bay Meadows and finished third in the Grade 3 Hillsborough Handicap in 1985. Candy Zip will be ridden by this track's all-time Thoroughbred leading rider Ramon Guce from post eight. The field will also feature Barbra B Handicap winner Run Raging Rhino Run and Foxy Fresh, whose previous start was a six-length victory.